Forget the warm summer breeze. Don't let these hot growth stocks pass you by. With the summer season officially in full swing and temperatures continuing to rise, we're intent on ensuring that the value of your portfolio follows suit. To that end, we asked three Motley Fool contributors for their favorite growth stocks to buy this month. Read on to learn why they like Universal Display (NASDAQ:OLED), Littelfuse (NASDAQ:LFUS), and Square (NYSE:SQ). To be sure, Universal Display began to rebound in earnest last month after the company posted strong quarterly results. Management also elaborated that OLED panel demand is expected to rebound in the second half of 2018, followed by an estimated 50% increase in manufacturers' installed capacity base in 2019, leading to another year of "meaningful growth." If that weren't enough, two weeks ago the stock popped again following reports that Apple had decided to adopt OLED displays across its entire iPhone line in 2019, expanding its use of OLED from just the Apple Watch and the high-end iPhone X. To be fair, some industry watchers have doubted whether that's probable given current supply constraints. But it seems to fall in line with Universal Display's prediction for enormous capacity base growth next year. With OLED stock trading at less than half its 52-week high, I think astute investors would do well to open or add to their positions before that growth becomes more evident. Neha Chamaria (Littelfuse): Littelfuse is one of those companies that would draw nothing more than a yawn if I tell you what it does: It manufactures circuit protection products. You know, those fuses and sensors that protect equipment from electrical hazards? That's how boring Littelfuse's business is. Yet the company's extraordinary operational performance and the mind-boggling run-up in its stock price in the past decade will stun you. LFUS Net Income (TTM) data by YCharts. Littelfuse has a lot going for it. It is the world's leading circuit protection company today with presence in more than 15 countries and has a well-diversified portfolio, with electronics, automotive, and industrial contributing 64%, 29%, and 7%, respectively, to its top line. After hitting $1 billion in sales in 2016, Littelfuse continues to grow at a torrid pace, closing 2017 with record sales, earnings, and cash flows. In its latest quarter, the company's sales climbed 46.4%, thanks largely to the acquisition of semiconductor manufacturer IXYS earlier this year. Double-digit growth in sales, with near-equal contribution from organic sales and acquisitions. Double-digit growth in earnings per share. FCF free cash flows (FCF) growth in line with earnings. Moreover, management also plans to return 40% of FCF to shareholders in the form of dividends and share repurchases in the long term compared with only 26% that it deployed in the past five years. Now those growth projections are too good to be taken lightly. 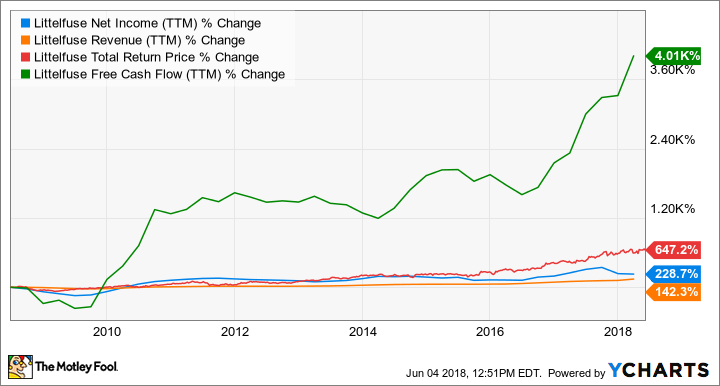 With emerging megatrends like the Internet of Things, electric and autonomous vehicles, and alternative energy also opening up new markets for Littelfuse, this is one growth stock you need to watch closely. Travis Hoium (Square): When starting a small business like a food truck, salon, or e-commerce business, there are a lot of services an entrepreneur needs to pull together, like point-of-sale, payroll, and scheduling. Square has become a go-to service for small businesses and has been able to increase both the number of services offered to customers as well as the size of businesses it serves, which is why it's my top growth stock this month. 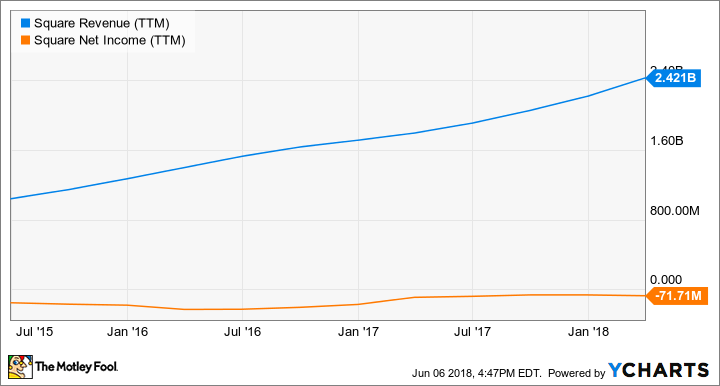 You can see in the chart below that Square has more than doubled revenue since coming public in 2015, proving it's capable of rapid growth, although it's also reported a net loss every year. SQ Revenue (TTM) data by YCharts. What management has done is pour all of its potential profits into growing the services it provides customers, which has held down profitability. There's now employee management, invoices, payroll, and even capital available to small businesses using Square. Once these capabilities are built out they can be leveraged by the sales team to grow the number of businesses Square has and the number of services used by each customer. They also lock customers into the Square ecosystem once they're up and running. What I like about Square's business today is that it's not only attracting small businesses, it's increasing the size of businesses it's working with and that's helping drive payment volume growth. In the first quarter of 2018, sellers with over $500,000 of annual gross payment volume accounted for 20% of sales compared to only 13% two years ago. Over the same time frame, gross payment volume increased from $10.3 billion to $17.8 billion. Financially, Square continues to grow and leverage its platform of services to improve its bottom line as well. On top of the revenue growth I showed above, Square reported $44.9 million in adjusted EBITDA in 2016 and a net loss of $0.50 per share in 2016. In 2018, it's expecting adjusted EBITDA to be $240 million to $250 million and net loss to be $0.04 to breakeven. The growing top line and rapidly improving bottom line make this a great growth stock to buy in June. We can't guarantee that these three companies will go on to beat the market going forward. But given Universal Display's impending rebound, Littelfuse's diversified product portfolio and enviable growth, and Square's appeal to small and large businesses alike, we believe the chances are high that they'll do exactly that. Investors would be wise to invest accordingly.